Strike Vector EX: When Console Beats PC, Heads Explode | "DESTROY ALL FANBOYS!" RageQuit Corporation blasts out a powerful killer PS4 “port” full of needed enhancements, but will it make enough noise to get the attention it deserves? Usually (okay, most, if not all of the time), a console port of a PC game will be deemed inferior by those nose in the air die-hard PC-ONLY flag-wavers who deem the very idea of a game console and those who use them as something best swept under a rug. Me, I don’t play that crap. I do however, play what I like on anything I like and as long as it runs fine and I’m happy? Well, that’s fine and yep, I’m happy. It’s recently come to my attention that the newly enhanced PlayStation 4 version of the PC game Strike Vector adds content not found in the original and those additions make for a better game overall game experience. Yeah, I said it and other than the highly tweakable visuals and adjustable frame rate quality PC gaming offers, it’s actually true here. The PC version was/is an online-only MP focused shooter with transformable and player customized ships zipping around in some VERY solid dogfights spread across some very nicely designed maps. Unfortunately, it’s only been just over 2.5 years since it launched and the player base is very nearly dead. 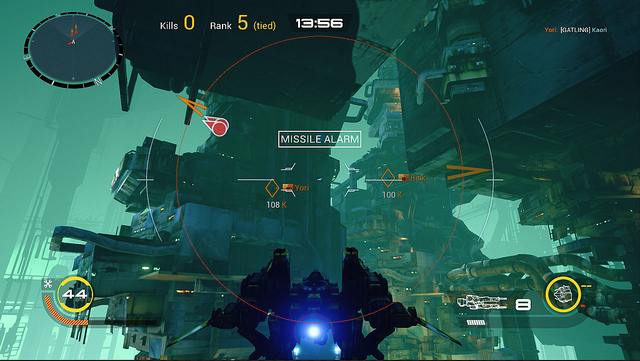 Strike Vector EX on PS4 ($14.99) adds a 15-mission solo campaign, AI bots for those needing to practice on opponents before hopping online, and a few other very welcome changes. If you’re old enough to remember the original WarHawk on the first PlayStation, the two interesting Shock Wave games along with the expansion disc on 3DO along with a few short rail/arcade shooters such as Scramble Cobra, Burning Soldier and other fast-paced FPS games, you’ll feel right at home here. SVEX takes some major inspiration from the PC classic Descent and possibly from an original Xbox game almost NO one remembers called Yager. But it’s trapped in a niche not many realize is still around or gets confused with bigger space games or smaller arcade shooters. The art style, customization, and gameplay are tight as a drum, but parental units need to know that M-rating is for some mild to moderate swearing in single player. But smaller games like this need to go bigger on some fronts so they get an audience that will buy in for a solo campaign of decent length first to hook them in and consider online once they’re stuck to the sofa. With no hype here, the online is sad and lonely at the moment because people are playing games that are more popular (but not necessarily “good” in some cases). Although the Unreal Engine 4 powered game was actually redone from the ground up for PS4, RageQuit has a few options here, though. They can get a PC version of EX up on Steam and hope the tiny community there appreciates it enough to grow a tiny bit more. Or, they can perhaps expand the PS4 version with episodic single player/co-op missions while adding in a few multiplayer maps with each chapter. Granted, the “plot” in SVEX is a bit generic yet overblown with eye-rolling (and barrel-rolling) situations and not-so memorable characters. So adding to it would necessitate some major reworking of what’s in the game currently, or at the very least, New chapters that are short, snappy and reliably cliff-hangy to draw players into paying for those new installments. Perhaps, RageQuit can take a page from Japanese developer Sandlot and make a longer SVEX game that, while not quite as long and grindy as the Earth Defense Force games, is something that will grab and keep the attention spans of gamers who want more than a weekend warrior experience. That said, the zippy, dynamic action here is well worth the entry price if you’re looking for a stellar shooter of the futuristic variety. Recommended. This entry was posted in 2016, Commentary, DAF, Features, Updates and tagged BUY This Game, Digital Games, Indie Games, Online Games, PlayStation 4, Playstation Network, PS4, PSN, RageQuit Corporation, Reviews, SCEA, Screenshots, Sony, Strike Vector EX, VGA 101, Videogame Appreciation 101, Videogame Reviews, YouTube by geelw. Bookmark the permalink.